Thanks, Mario | I Am Not A Restaurant! 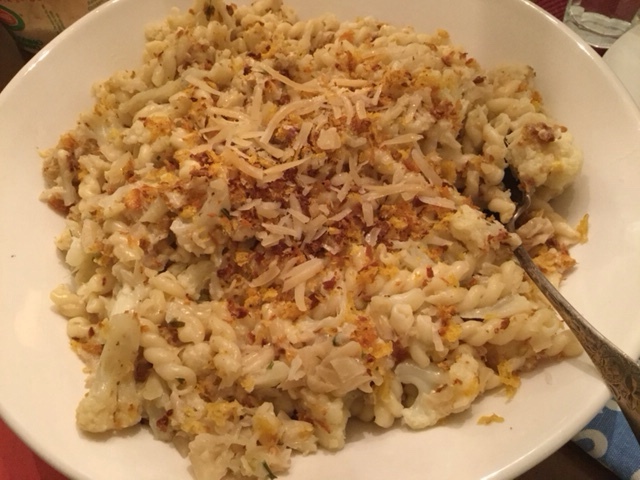 Jan30January 30, 2016 • By Betsy Karetnick • This entry was posted in cauliflower, Comfort Food, Dish of the Day, Pasta, Recipes and tagged cauliflower, Mario Batali, Pasta. Bookmark the permalink. I’ve made a slightly similar recipe from the NY Times a few times that we really like!! http://cooking.nytimes.com/recipes/1016841-rigatoni-and-cauliflower-al-forno I make a few changes; add some Italian sausage and a diced onion – oh, and substitute some pine nuts for the sage as we don’t care for sage. Yum, yum, yum… actually made it for dinner last nite. I vote yes for sausage! Much easier than Iowa caucus.